Old Town Quito has been preserved better than jam in a jar. The colonial centre of the Ecuadorian capital, Old Town is lively and energetic, with beautiful architecture and winding cobblestone streets. In 1978 it was made UNESCO’s second World Heritage Site, after the Galapagos Islands. Known as el centro historico (the historical centre) by the locals, Old Town’s highlights include Plaza de la Independencia (Independence Square) and Basílica del Voto Nacional (Basilica of the National Vow). Wandering the narrow streets of Old Town is never boring. Musicians, dancers, food vendors, nuns, you name it and they’ll be navigating these streets too. Sunday mornings are ideal to go exploring. The streets are all shut off to traffic from 8am until 2pm, so you can manoeuvre the cobblestones far easier. In fact, we advise you to get up very early any day, before the streets fill up, and just look around. This place is beautifully frozen in time. There is nothing quite like it. At the centre of Old Town is the aforementioned Plaza de laIndependencia (Independence Square). This main plaza largely commemorates Ecuadorian independence from Spain as well as being a symbol of executive power in the country. Surrounding the square includes Basílica del Voto Nacional (Basilica of the National Vow) – a sublime gothic cathedral with puma, iguana and turtle-inspired gargoyles – and the Carondelet Palace. The latter is Ecuador’s presidential palace; it has French Renaissance architecture and uniformed sentinels stand guard at all times. A short walk away is the La Compañía de Jesús (Church of the Society of Jesus), with its famous golden leaf central nave. 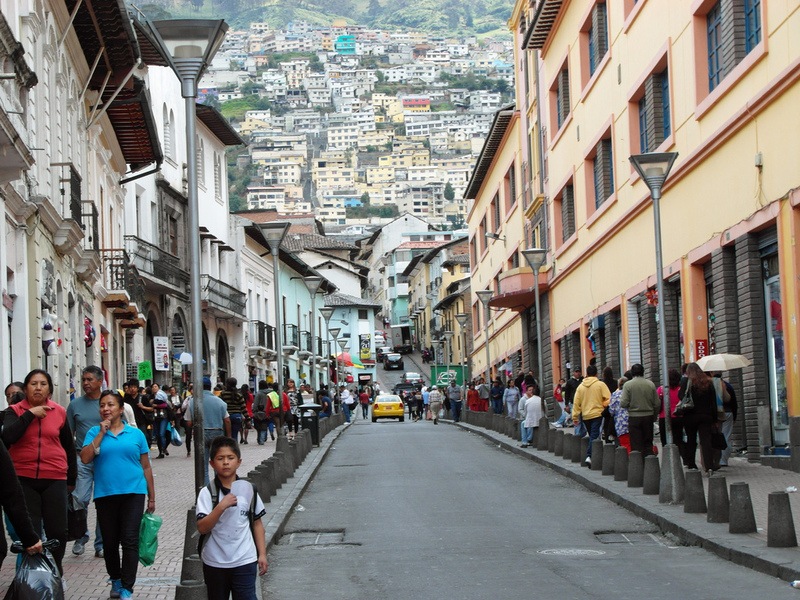 When arriving in Quito you’ll likely be hit by the intense altitude at first. Sitting on the eastern slopes of the Pichincha Volcano, it is one of the highest cities on Earth. Settled on hundreds of years ago by the Quitu tribe, it eventually fell under the control of the Incan Empire. Not willing to leave it to foreign invaders, the Incas then burned it to the ground after Spanish conquistadors arrived in 1534. Rumiñahui,the Incan warrior who led the resistance against the Spanish, is today considered an Ecuadorian national hero.